It’s the sweeping curves of the Knavesmire that takes centre-stage this week, with York’s four day Ebor meeting providing a feast of top class Group action and competitive handicaps for us punters to get stuck into. No surprise to see Willie Haggas on this list as his string are renowned for excelling on the Knavesmire, and it’s no different when it comes to Ebor week. Solid stats from team Haggas and he’s managed to saddle at least one winner at each of the last five Ebor meetings. A bit skinny on the profit front but nevertheless a very solid set of figures to chew over. Significant improvements on both the S/R & LSP from just the two filters make it an mini-angle well worth keeping at the front of your mind. It’s the 60% win & place strike-rate that particularly catches my attention, suggesting that he really has his string in tip-top shape for the rigors of Ebor week. Dods clearly loves targeting those sprint contests! There’s every chance those trainers will have winners/placed horses outwith the mini-angle parameters as well, so I’d never advise ignoring their other runners just because the don’t ‘fit’ within the tighter stats, but those mini-angles have certainly been where their strings have been most potent at recent Ebor meetings. Best of luck if you are getting involved in the York action this week (which I’m sure many of you are!!) 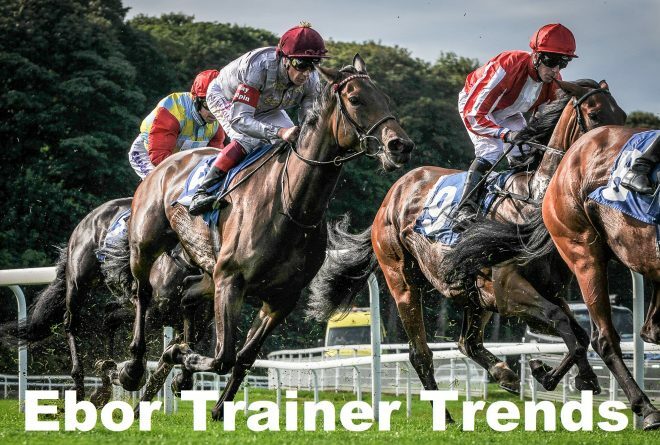 and if you want to see what the NTF race analysis is highlighting – I’ll be covering around 10 races over the four days using my NTF race trends – then just drop me an email at info@narrowingthefield.co.uk and I’ll get you set up as a full NTF member for the next seven days (it’s a one-off £10 sign-up for the York coverage). How does Dods do at 5.5f and 6f? It’s limited numbers for Dods at the meeting so I wouldn’t class his other distances as negatives, more his 5f runners are a positive, for what it’s worth though he’s had 4 runners over 5.5f & 6f and they’ve returned 4-3-0-9 (0w, 2p). Pure speed (5f) a positive for sure (limited as the figures are) but wouldn’t ignore the longer trips. must be worth a poke Ben? Can definitely see the case for the horse, certainly from a handicapping perspective and obviously Dods likes the meeting with his sprinters. Its very likely we might see Mabs cross then, as ran three fine races in defeat all g2 and g1…will it be this time I wonder. I wouldn’t put York near the top of SDS’s favourite tracks, certainly not in last 6 years. His record in handicaps in that time is 7/106 | 6.5% S/R | -£51.12 LSP – 43% below expectation. Doesn’t mean he can’t or won’t win, obviously, but it’s not been one of his ‘positive’ tracks of late.